The ladies of 1947 Timber plan to find a wife for Charles, their new single minister. Fiona, an accident-prone and outspoken part-time librarian is looking for a knight on a white charger to carry her away from her small town life. Fiona and Charles are thrown together as they begin to solve an old mystery they find in a library book. Will Fiona’s white knight ever show up to sweep her away? Will Charles ever run out of invitations for cream cakes and lemon slice? Fiona might just discover the sound of hoof-beats when she least expects it. No sooner had Charles Redpath entered her thoughts than he entered the library. “Oh I know what you meant.” She looked up expecting to see an expression of censure or hurt or disapproval, but instead Fiona could swear his eyes were twinkling, very nice brown eyes with a definite twinkle. Now why did she think that? “Not if you’re preaching them on Revelation,” she retorted. She looked at the book suspiciously. Was she wrong in her evaluation? Was he going to start giving her a private lesson in the scripture? They were plain envelopes, each bulky enough to contain a letter or note. One had the capital letter D on the front. The other said J in a slightly different hand. “I can look to see who checked the book out last,” said Fiona,” but it was likely a long time ago. I mean, how many people would..” There she went again, putting her foot in her mouth. “I’ll check the records,” She clamped her mouth firmly shut before she could shoot herself in the foot again. She giggled a little. What was this fetish she was developing about feet? “Well, let’s check,” said Fiona, starting to slide her nail under a flap. “We can’t do that! They’re someone’s private letters!” Fiona gave a quick look at Charles’ face and concluded the outrage of his words wasn’t echoed in the curiosity in his expression. “Look this one isn’t even sealed,” said Fiona, picking up the other letter. “So they’re not really private.” She flipped it open and out popped a sheet of paper. She pushed it between them sideways on the counter so they could both read. 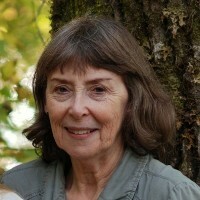 Sharon McGregor lives on beautiful Vancouver Island. She hasn’t escaped her prairie roots, though, as her romances are set in small town North America.. Sharon loves to write romance, mystery and humor, if possible all three at the same time.